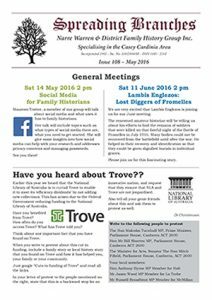 Spreading Branches | Narre Warren & District Family History Group Inc. Spreading Branches is published quarterly in digital and hard copy and sent to members and other interested groups and organisations. Download our latest edition in pdf. from here or browse past issues. Member of the Year: Jane Rivett-Carnac – AGM roundup – Frances Fitzgerald Elmes (1867-1919) by Marianne Rocke – Casey Cardinia Remembers the good, the bad and the ugly – Then and Now: Narre Warren North – Writing Competition entries: Joachim Popp by Brenda Wheeler, Getting sidetracked while researching a soldier by Jane Rivett-Carnac, Hard life, hard times by Margaret Hunter – Moran-McLellan-Duncan reunion – The Research Room: this thing called LibraryThing. Another successful cemetery walk – Cranbourne 22 April 2018 – Phyllis Bould’s magnificent poppies – The Research Room (on the computers) – Our stately trees (Casey Cardinia Remembers) – Writing competition entries: An unconventional family by Margaret Hunter, She was always nice to me by Lynne Bradley. The trouble with Lyndhurst (Casey Cardinia Remembers) – Captain David Jones of Tandderwen Orchard – Writing Competition entries: Basking in the Moonlite by Lynne Bradley, Interesting and unexpected aspects of research by Jane Rivett-Carnac – Land titles by Marianne Rocke – On the shelves (in the Research Room). Writing the war at Cranbourne Library – Local History Archive & NW&DFHG Research Room launch – Colac and VAFHO Family History Expo – On the shelves (in the Research Room) – Berwick RSL (Casey Cardinia Remembers) by Eileen Durdin – Writing Competition entries: Death on the high seas-one family’s immigrant experience by Ken Swadling, England, 26 July, 1948 by Di Christensen, A Promise by Moreyn Dimsey and People that bind us from our past by Kerryn Maxwell – Vale: Alice Amelia Pattison. The beginning of NW&DFHG – AGM Round up – Do you read genealogy blogs on the net? – Rootsweb mailing lists – Writing Competition entries: Several violent deaths in the family by Susan Arlove, Emily’s choice by Jane Rivett-Carnac – One man’s treasures by Lynne Bradley – Narre Warren Mechanics Institute (Casey Cardinia Remembers) – Melbourne University Archives. Fun & Frolics at Narre Warren North by Max Thomson – The grieving mother by Di Christensen – Greg Clydesdale Square (Casey Cardinia Remembers) by Eileen Durdin – A successful sausage sizzle by John Uren – For some the bell tolled: a World War walk in Harkaway Cemetery by Jane Rivett-Carnac, Writing Competition entries: All it took was a photo by Kerryn Maxwell, Lakes Creek State School by Ken Swadling, An interesting military connection found while researching my New Zealand family by Jane Rivett-Carnac – A teacher in your family by Marianne Rocke – New in the Research Room. Our move – Great recognition for local Presidents by Fay McCoubrie – Clusters (Casey Cardinia Remembers) by Lynne Bradley – England and Wales research: the new GRO online index by Marianne Rocke – Writing Competition entries: There is a Pirate on our tree by Jane Rivett-Carnac, No skeletons by Marianne Rocke, Henry Barton Stray Sharp by Lorraine Taylor – The Shire at war (Alberton) by Di Christensen – Vale: Judith Johnson – New in the Research Room. Vale Stephen Cowell – Research Room News – Conviction by Gay Hendriksen – Looking back … and ahead (Victorian BDMs online) – Patrick Northeast Wetlands Reserve – JC Lloyd Square – City of Berwick Bicycle Path Network. Pakenham Cemetery’s indomitable women – Lucy Pepper – Pakenham Cemetery’s 150 anniversary – 2016 workshop schedule – Nar Nar Goon conversations at Casey Cardinia Remembers – Ask Granny – Our dancing skeletons. AGM Roundup – The Last Post – Research Room News and new additions – The cousin of my Great Aunt was a Victoria Cross Winner (Albert David Lowerson) – Cranbourne’s Floral Clock. 100 men, 100 years: a World War 1 Walk in Berwick Cemetery – Springvale Botanical Cemetery tour – Casey Cardinia Remembers and Mother’s Day – Research Room News and new additions – Private L Papley. War Comes to Australia: 70th Anniversary of the Bombing of Darwin 19 Feb 2012 – 2012 AGM – Research Room News and new additions – Headstone Theft a Grave Mistake – Rookwood Cemetery – NW&DFHG Members’ Interests.